The guitar is known to be one of the most beautiful instruments, aesthetically and audibly, for most people’s taste. It is also one of the easiest and most common instruments to learn, especially for kids and teenagers. Specifically, the acoustic guitar is usually considered to be the first step towards learning how to play an electric guitar. It follows the basics without relying on an amplifier. So, it relies on pure skill and technique. After careful research and product testing, we are giving you the best beginner guitar in today’s market. Jasmine S35 Acoustic Guitar is something you will show off because of its physical beauty. It has a smooth satin finish. Its sides and back are meticulously laminated. This guitar can be a beginner’s first or an expert’s second. It gives off full tones whatever musical style is being played. 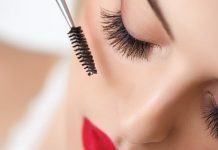 It is durable, sturdy, and convenient to use because of its perfect weight, shape, and texture. 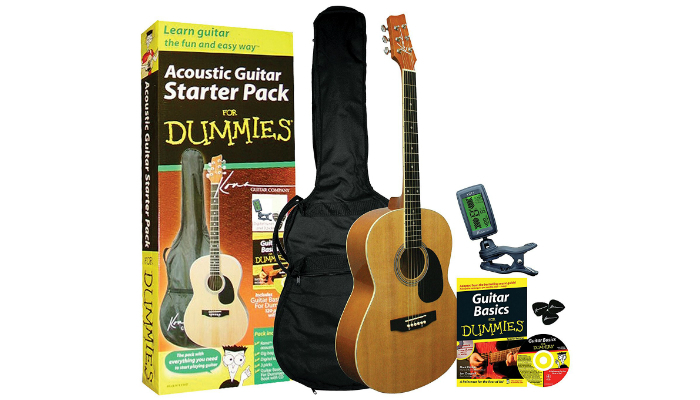 Guitar For Dummies Acoustic Guitar includes a gig bag and training essentials such as an audio CD and a book. You do not have to think about other things to buy because the pack has everything a beginner needs. The guitar has a spruce top to produce rich tones. 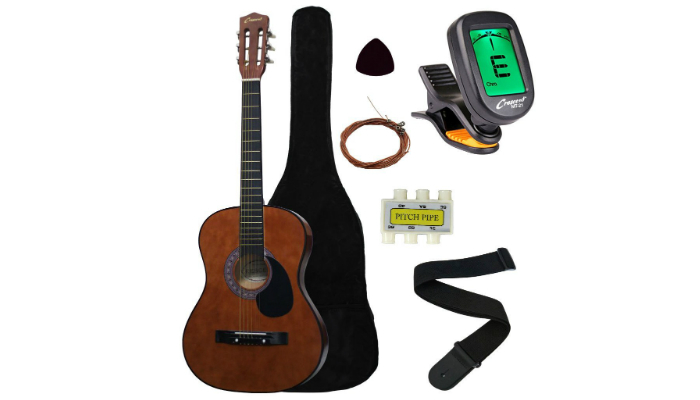 Crescent MG38-CF Acoustic Guitar Starter Package is another product which comes in a useful set for beginners. 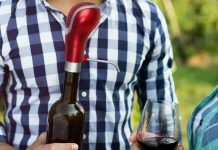 The instrument follows the standards of a typical guitar for first-timers. It gives a clear and loud sound which rings or sustains for a dramatic feel. Aside from being a guitar for beginners, its quality is still perfect for amateur performers who go for rock, jazz, blues or country music. 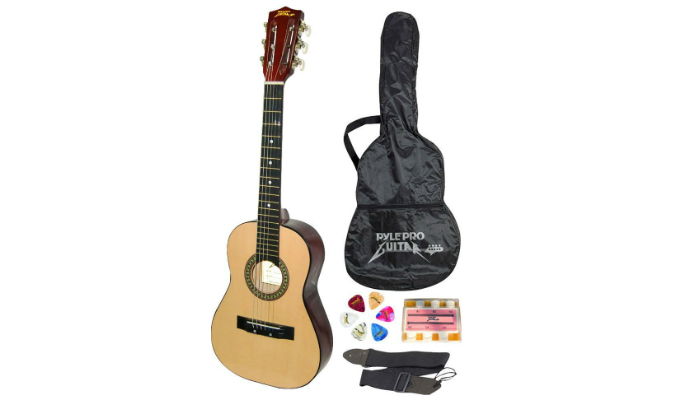 Directly Cheap Acoustic Guitar Starter Package is so simple, making it a great gift for kids. The guitar has vivid and attractive colors. It has the right medium size for beginners. 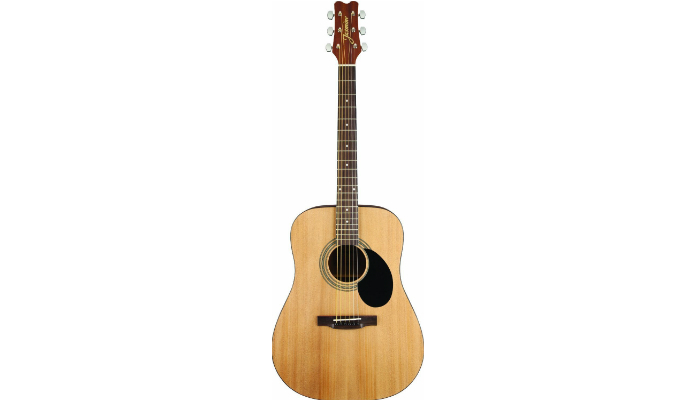 Pyle Pro PGAKT30 Beginner Acoustic Guitar has a style more suited for most people. It is smaller than average, so it is considered to be a children’s guitar. Despite the size, its design is still similar to what professional musicians use in concerts, gigs, and other public performances. It is made of high-quality materials such as maplewood for the bridge and fingerboard, nanmu for a sturdy neck, and linden plywood for the rest. 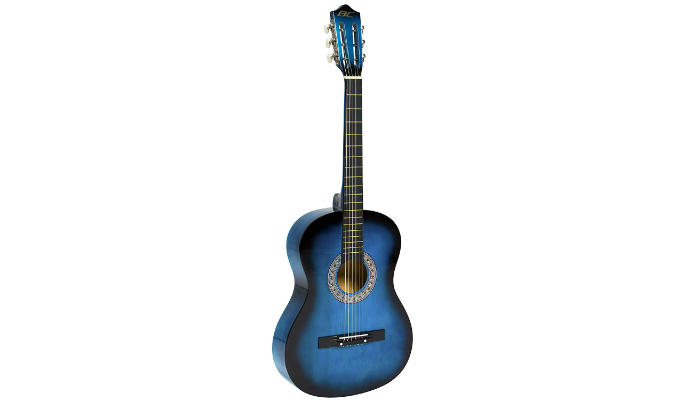 Best Choice Products Beginners Acoustic Guitar has a glossy finish for durability and aesthetic purposes. It is designed for right-handed beginners. Its wooden top is solid, but its curves are smooth for comfort. The strings have the right height for easy strumming to minimize hand fatigue. The tuning pegs are convenient to adjust because of its smoothness. Usually, one guitar is composed of several kinds of wood. These woods affect the instrument’s tone. Cheaper guitars are composed of laminated or synthetic wood – beautiful but not durable. Ones in a higher price combine both laminated and solid woods. 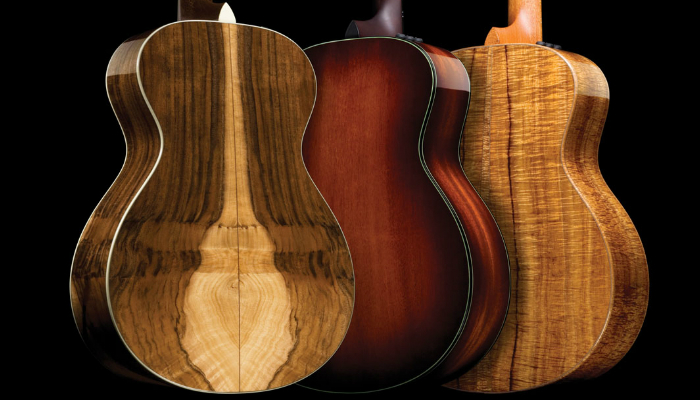 Meanwhile, the most expensive guitars are made of pure solid wood. These produce more high-quality sound. Tops are usually composed of cedar or spruce. The sides and back typically go for maple, mahogany or rosewood. Cedar is darker than spruce. It is preferable for low action and fingerpicking. Spruce is more common because it is one of the strongest. It can handle hard strumming. 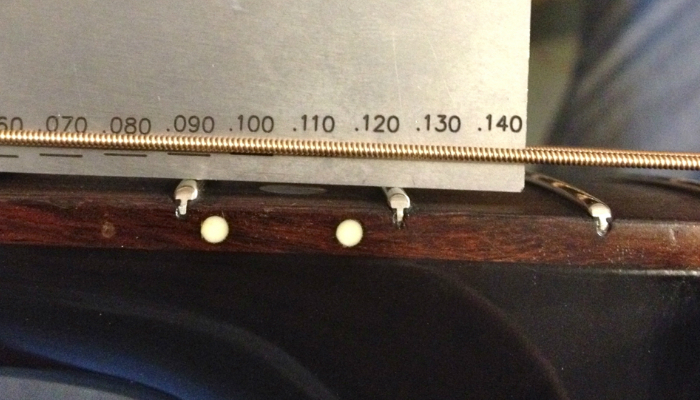 Maple is good for high tone due to its clarity. Mahogany is one of the best because it gives the most soothing sound. Rosewood is preferable for more complex or professional plays. Your hands, fingers, and arms are the stars whenever you play an acoustic guitar. That’s why you need to prioritize how comfortable these body parts are during practice or performances. The first thing you need to think about when it comes to comfort is the guitar’s action or strings’ distance from the fretboard. Very high action or a wide gap between the strings and fretboard can strain your fingers. This action is more suited to professionals or experienced players. This term may be new to your ears. Intonation refers to the guitar’s tune when you strum along with the fretboard. To check, play notes at the 12th fret after tuning. Sound should not be flat or sharp. Fixing the problem might need some drastic changes based on the degree of the guitar’s flaw. We mentioned how price varies when it comes to the guitar’s composition. Beginners actually do not need to invest on a guitar that is made of genuine solid wood because synthetics can really sound good as well. The important thing as a first-timer is to have a guitar that gives the right tone and comfort. Once a person knows the basics, then he can proceed to the next level and buy a more high-quality guitar. The best beginner guitar should have a natural and clear finish. We believe that a beautiful guitar will enhance and sustain the beginner’s interest and determination. Eye-catching designs or colors such as sunburst give appeal to the guitar. However, be careful about purchasing a guitar with a heavy finish. A heavier than average finish can affect the quality of sound. We recommend a translucent finish, one that can still show the wood grain underneath. You can resort to a guitar with extra decorations such as gold tuners, but remember that those bonus features do not affect the instrument’s sound quality. For fun, you can have your name indicated on the fretboard. 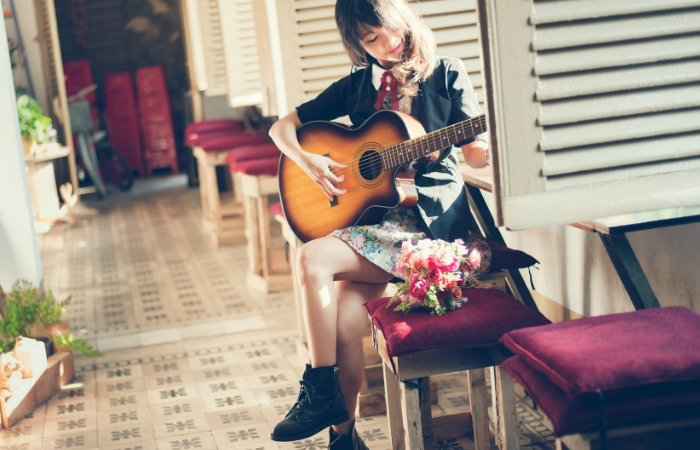 If a beginner wants to learn how to play an instrument, acoustic guitar usually comes to mind. It is common in stores and quite easier to master than most instruments. 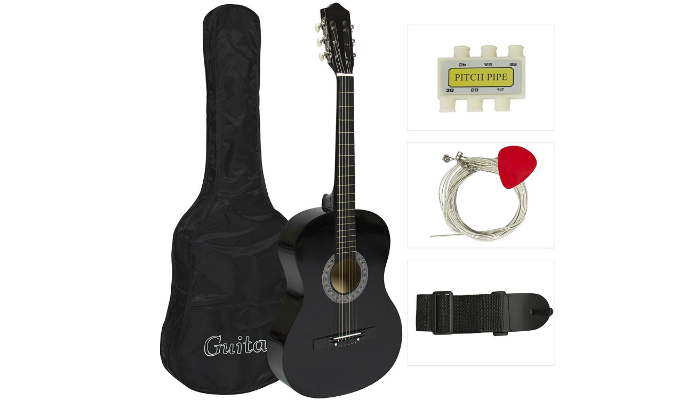 Guitars for beginners are normally sold in packages or sets that include training materials and accessories. Solid wood guitars give the best sound, but first-timers do not have to spend so much money on this type of instruments. It is better to purchase an affordable yet functional guitar made of synthetics or laminated wood – at least for starters.